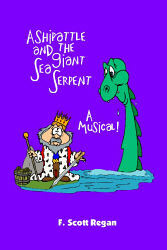 Ashipattle and the Giant Sea Serpent: A Musical! CHILDREN’S MUSICAL. Adapted from the Scottish folktale, “The Meester Stoorworm.” When a giant sea serpent threatens Scotland, King Oswald offers half of his kingdom to anyone brave enough to slay the horrible monster. Determined to defeat the beast, Ashipattle, a clever lass, bravely heads to the seaside, where she boards a small boat and meets up with the monster. The sea serpent, who has an insatiable appetite for Scots, immediately swallows Ashipattle with one big gulp. To free herself, Ashipattle thinks quickly and uses her bucket of peat coals to start a fire in the monster’s stomach! This hilarious musical is suitable for elementary school students or for touring groups and includes five original songs. F. Scott Regan has adapted numerous stories for theater and directed plays for children, youth, and adults for the Treehouse Troupe and the Horizon Youth Theatre. He is an Emeritus Professor of Theatre at Bowling Green State University and has held several positions in the American Association for Theatre and Education.